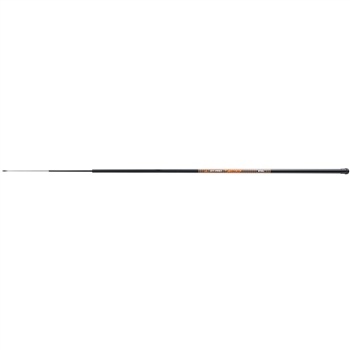 The Mitchell GT Pro Pole Combo includes a fishing pole and a rig complete with a hook and float and offers outstanding value for money. The pole is built with a strong glass construction and features a clip on the end. This clip allows you to loop your rig onto your pole quickly and easily. Each pole has an improved finish quality with eye catching, modern graphics. The poles are available in three different models, a T-300 with a bright orange colour graphic, a T-400 with a bright yellow colour graphic and a T-500 with a bright red colour graphic. The T-300 has a 10ft length, the T-400 has a 13ft length and the T-500 has a 16.5ft length. Each pole is supplied with a complete rig that includes vital components like the hook and float etc. Select your choice of Mitchell GT Pro Pole Combo from our drop down menu.